Reflections on technology at Johansson Projects. 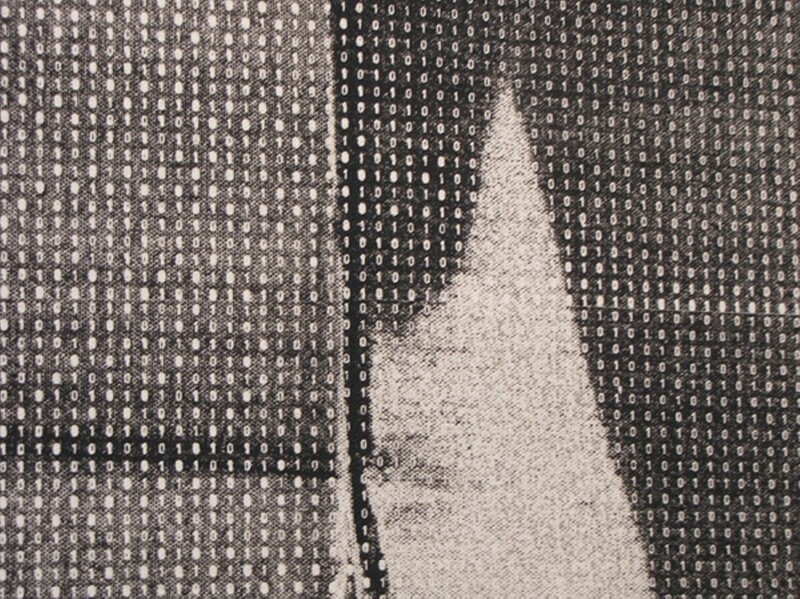 Detail of Hunter Longe's "Binary with Distortion." Los Angeles art venues are currently abuzz with Pacific Standard Time, a celebration of the region's 1960s-70s Space and Light art. The series' show now at Orange County Museum of Art, State of Mind: New California Art Circa 1970, is coming to Berkeley Art Museum shortly, but if you can't wait, see New Document. Computerization has changed the world, including us, as the press release states: "Windows, gridded matrices, split-screens and drop-shadows ... become an inherent aspect of making and viewing objects." Andrew Chapman, Matthew Draving, Hunter Longe, and Hugh Zeigler explore this change in mentality using the "guilty" technologies. Several also probe the interaction between the punch-card/coordinate systems of weaving and digital scanning. Chapman's "Notwithstanding," a digital print of undulating sheets of window screening, looks almost mathematically precise, while his oil painting "Folded the Away" is all painterly "analogue" smudges — with a folded cloth form (a shirt?) tucked behind the virtual glass. Longe's "Binary with Distortion," a silkscreen print on canvas, resembles a Clifford Styll abstraction with its sharp, hovering forms — until we look closer and discern that its source image of irregularly folded screening is actually arrays of zeros and ones, white on black, like an infinite odometer. Draving and Longe's "Open Screen Unit," a cubical aluminum-frame sculpture loosely draped with a diaphanous mesh screen for digital projections, examines overlapping/colliding systems as well. So do Draving's "Close Burns" pieces, wall-mounted sculptures resembling fabric-covered speaker boxes (remember them? ), inset with miniature video screens covered with glass-bead membranes, the hexagonal patterns suggesting insect-eye views of the world; and Longe's two manually warped "New Window" digital prints on linen, with their photos of sturdy door and window frames pulled and stapled into pleasing curves; the blacked-out sash window is a nice conflation of Microsoft's logo and Duchamp's "Fresh Widow." Zeigler's abstract broken-stripe collages (very Sixties) and his related video animation, panning across that painting, now infinitely long, explore how system and method can generate new works.